Like most of us, I first encountered West Side Story through the 1961 film version, with its unforgettable late fifties/early sixties New York ambience: chain-link fences surrounding concrete-covered playgrounds, dingy streets, tenements, and – of course – fire escapes. The first surprise on entering into Hall One of the Sage Gateshead was the lack of any of these iconic images. Instead of tenement houses zigzagged with fire escapes, we were faced with a bare stage, framed by a curved black brick wall. The only fixture was a ladder, leading to a large window upstairs. Throughout the performance, doors sometimes opened in the wall, but most of the time they remained shut, leaving it seamless and forbidding. Other pieces of stage furniture – chairs, tailors’ dummies, Maria’s bed – were nondescript and impermanent, deftly brought on and taken off the stage by the members of the cast as the change of scenes required. This minimalist staging moved the action from the 1950/60s New York to a less localised, more neutral setting. This was the intention of the choreographer and director Will Tuckett, who explained in the show’s printed programme: ‘I’m trying to … strip it back, to remove things that fix it to a specific cultural period, or cultural point’. By doing so, Tuckett eliminated the possibility of seeing the musical as an account of a conflict which flared up at a particular time and place, and which may be long resolved or irrelevant to us. This production told not so much a West Side story as an Anywhere story, making us feel that what we were witnessing could happen at any time to anybody. Instead of historical detachment, we experienced immediate emotional impact. If the original West Side Story updated Romeo and Juliet in order to make it relevant to mid-twentieth century young Americans, the Sage production removed the risk such an update carries: a possibility of it becoming frozen in its own historical moment. Watching this performance, it was impossible to think that disaffected youths, deprived communities, intolerance and division belonged to the past or to some distant place. As the executive producer, Katherine Zeserson, pointed out, ‘The conflicts and prejudices laid out in the show have a frightening resonance in 2012 Britain, with increasingly violent gang activity in inner-city communities, and a devastating failure of civil society to cherish and nurture the well-being of children and young people.’ By removing some of the culturally specific references, the producers made it hard to ignore this contemporary resonance. The production’s visual stylisation extended to the costumes, which were neutral rather than period specific: simple dresses for women and plain shirt-and-trouser combinations for men. Occasionally, some of the women (not just the tomboy Anybodys) wore leggings instead of dresses, which gave the show a more contemporary look. Interestingly, the costumes were colour-coded – red for the Sharks and blue or white for the Jets – and identical in cut within each gang. This created a feeling of uniformity and a group, rather than individual, identity. For most of the action, Tony and Maria stood out, wearing a chequered white-and-blue shirt and a white dress respectively. However, the fact that all other characters looked homogeneous, combined with the choreography – of which more below – made this West Side Story a tragedy of society, rather than of individuals. Undoubtedly, dancing was this production’s outstanding element. It sparkled with energy, beautifully conveying emotions ranging from aggression to tenderness, hope, and despair. Tuckett’s original choreography evolved through the audition and rehearsal process. In his words, ‘this piece is about young people having their own voice’, and he was ‘not creating it at [his] kitchen table and then teaching it to them’. This worked for the cast recruited through open-call auditions, rather than belonging to a pre-existing ensemble. The actors portraying the Sharks and the Jets came together for this one production and became one unified body. While there were outstanding individual vocal performances by Leo Miles (Tony), Melissa James (Anita), Daisy Maywood (Maria), and Rebecca Jayne-Davies (Rosalia), the most impressive part of the show were the group dances. The most breathtaking of those was the ‘Somewhere ballet’ – a sequence of dance and song which does not appear in its entirety in the film version, where Tony and Maria sing ‘Somewhere’ as a duet, without dancing. 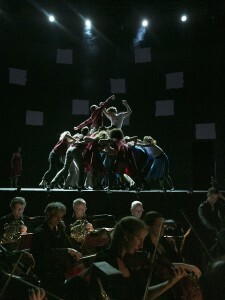 The Sage production, in keeping with the stage version, had the song performed by Rosalia from the window above the stage, while the ensemble enacted the emotions through dance. While the words of hope – ‘somewhere we’ll find a new way of living’ – sounded, members of both gangs in their colour-coded outfits mingled and danced together, which was reinforced by red and blue lights forming a harmonious rosette on the backstage wall. When the music turned menacing, the ghosts of Riff and Bernardo appeared to re-enact their deadly fight. With that, the two gangs gradually separated and reformed in their original, hostile configurations, culminating in a divided crowd, carrying their fighting champions aloft and forming a human base for the combat. Again, we were not witnessing a drama of individuals who go against their society, but of a society itself tragically divided and incapable of reconciliation. This representation of a failing society made the Sage’s West Side Story not only a brilliant show, but also a reminder that – notwithstanding the Big Society – we are a long way from abolishing social divisions and inequalities. In this respect it is interesting that, despite the production being part of the RSC’s Open Stages project, which works with regional and amateur theatres, most of the cast trained at prestigious performance schools and none of them, as far as I know, lives in the North East. The region was represented by the excellent Northern Sinfonia orchestra, but it seems that when it comes to opportunities to get your acting, dancing, and singing talent recognised, there is still a substantial north-south divide. All photo credits to Mark Savage.